I have been holding out on you. I have a secret passion for dying wood. I love the vibrant rainbow colors that result. I love the smell of the wood and the beeswax seal. It all just makes me happy. 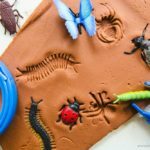 If you have older kids (or even younger ones) I’m sure they would thoroughly enjoy this project. But to date, the mess averse mom in me has yet to venture down that road. It can get messy. Messy in a way the control freak in me would not enjoy with a 2 year old. I inevitably have rainbow colored fingers for a day or two after and so, I reserve this project just for me (and preferably before, not right after a manicure haha). Besides, the kids get to play with the finished product anyway. Ok! Enough rambling. Lets get on with it shall we? 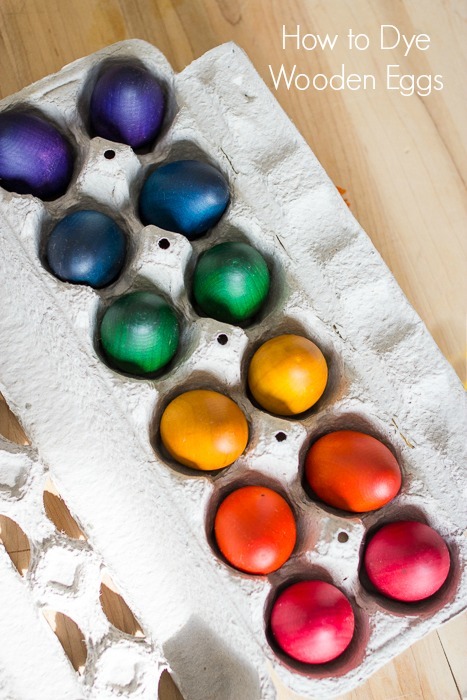 My most recent wood dying endeavor was rainbow dyed eggs. 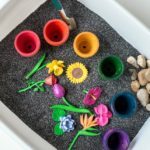 The intention was for them becoming a plaything for Little E. We quickly found out there are many, many, ways to enjoy them. Little E loves them! In fact they are the perfect size for his baby hands to hold. He delights in putting them in and taking them out of the old egg carton I am storing them in. 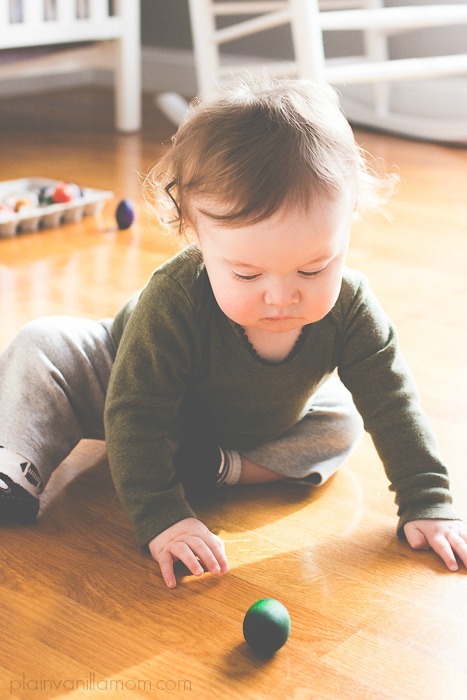 He crawls after them as he rolls them around, and when banged together they make wonderful music to his 13 month old ears. My two year old enjoys them too. 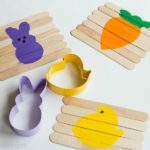 They are perfect for an egg hunt as an alternative to plastic eggs. 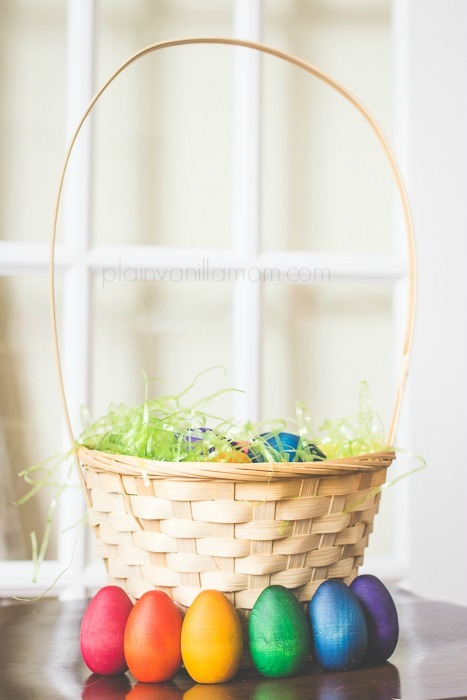 Especially if your little ones are like mine and you have egg hunts almost daily leading up to Easter. (We’ll save the plastic filled ones for Easter for a treat and use these until then). You do know there’s no such thing as just one egg hunt right? We use them to practice colors. Find the red egg. Find the blue egg. 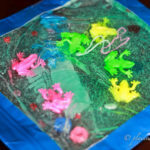 I dyed a few dozen so we can use them for counting, color sorting, patterning and more. Seeing as Easter isn’t that far away they do make a great decoration for this time of year so don’t think these are just for kids. 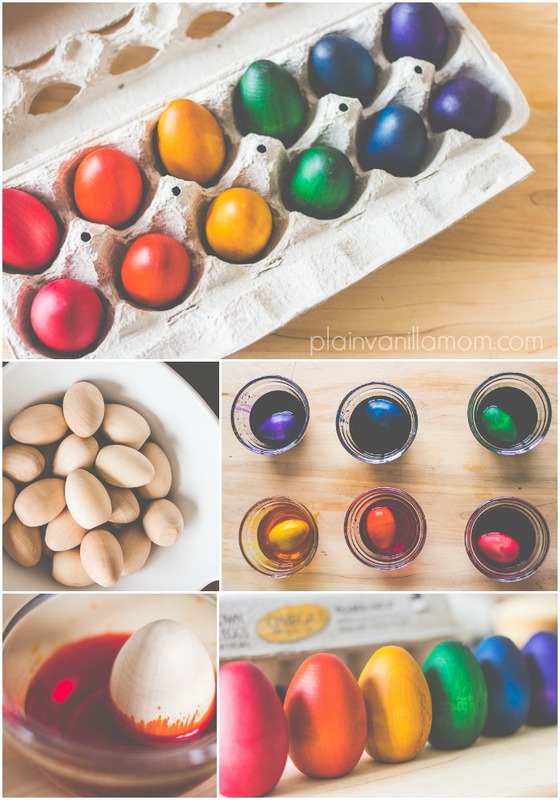 I love the idea of dyed wooden eggs to keep and display year after year. 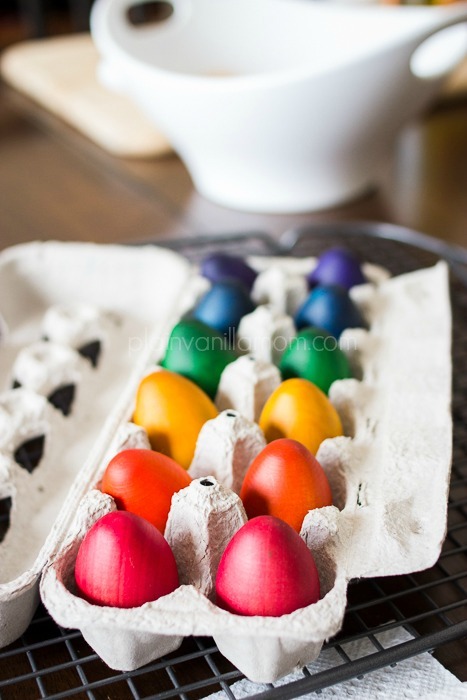 Dye a whole bunch of them and fill a basket! Alright, so how do we dye them? 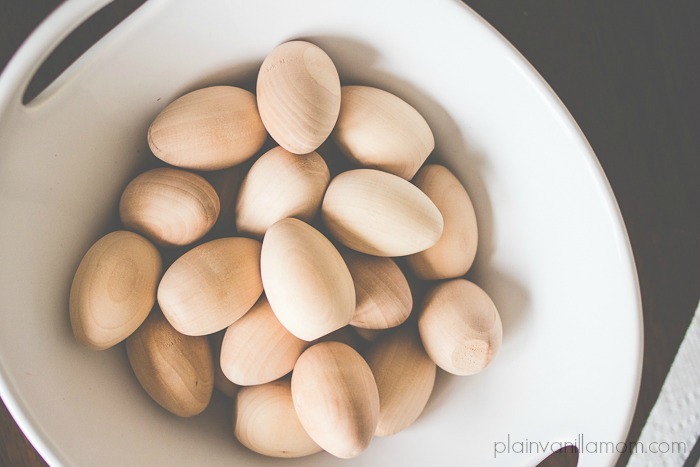 Unfinished Wooden eggs. Like these: THESE or check your local craft store they might carry them. Beeswax wood polish. I use this one that I found on etsy but again look around. You might be able to find some locally or on amazon. 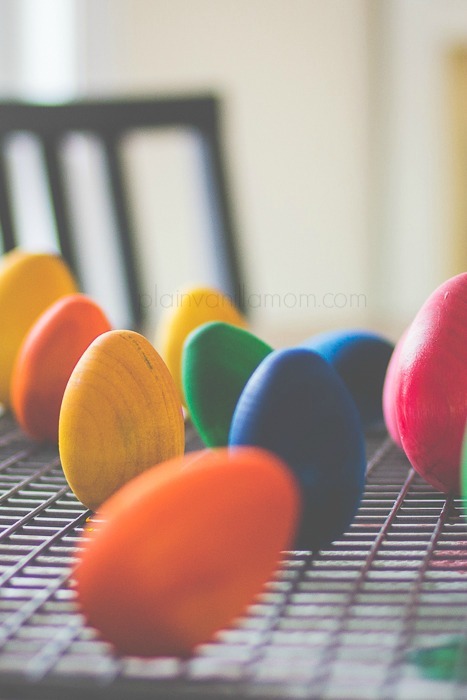 Once you have all your supplies it’s as simple as dying Easter eggs. I’m going to let the pictures do the talking. (see below) Be sure to let your eggs thoroughly dry before sealing them. That step is probably optional by the way. They are beautiful without the polish. I just like to do it to give them a more polished, finished look. It deepens the color and brings out the wood grain a bit and is very pretty. I think it makes them a little more durable in the hands of toddlers too. Tip: If you do decide to seal them, once they are completely dry, give them a good coating of beeswax polish. Just rub it in using your hands. Let them set for about a half an hour and then buff off the excess with a dry cloth. One word of caution. 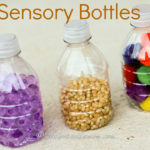 I would not let your little ones play with these if they are still into mouthing things. 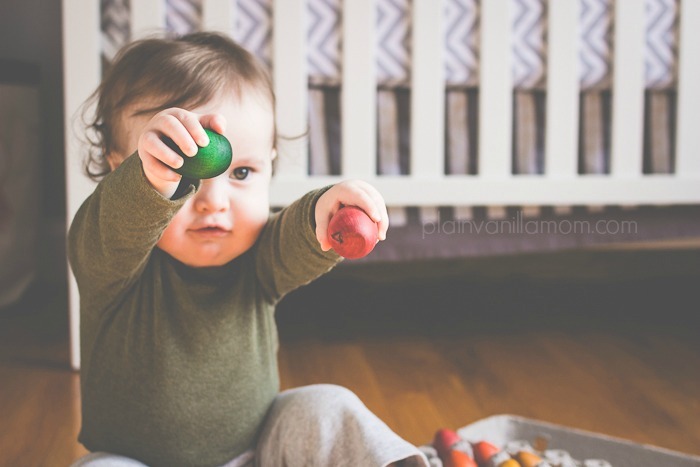 Little E actually had a set of unfinished eggs he played with from about 6 months old and he loved them just as much even then. Remember always supervise. 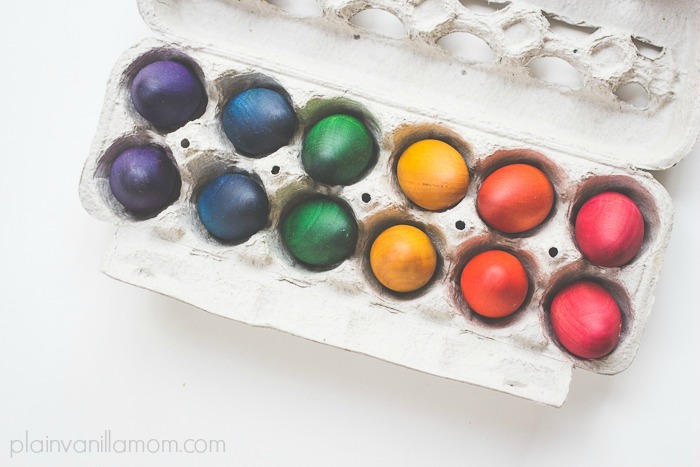 These rainbow eggs are stained with watercolors and, although I can’t say for sure because Little E hasn’t tried to eat one yet, I suspect the color would bleed. So what do you think? Want to make some? They are so pretty there’s a chance they will never be packed away with the rest of our Easter decorations. In fact I’m thinking that they would be great for the kids to use in their play kitchen when Easter is over. 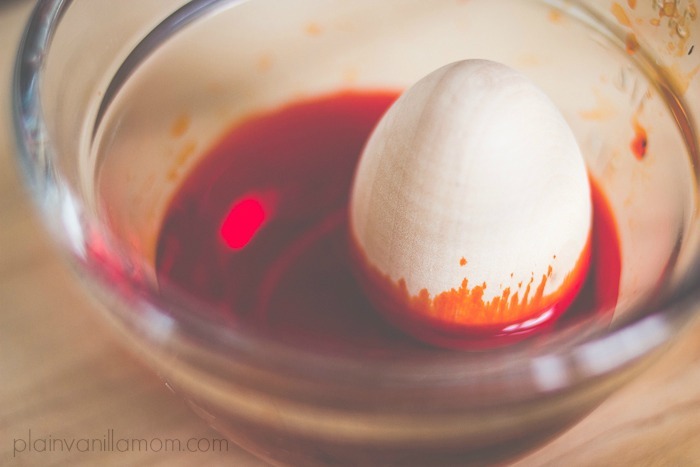 In need of other “egg-cellent” ideas now that Easter is approaching? Sorry I can’t help myself when it comes to egg puns. Our Egg Buddies are lots of fun too! disclosure: Plain Vanilla Mom participates in Amazon affiliates. This post contains affiliate links for your convenience. That means that if shop through any of these designated links your purchase price does not change, but we thankfully receive a portion of your purchase to help keep us running. Thank you for your support. 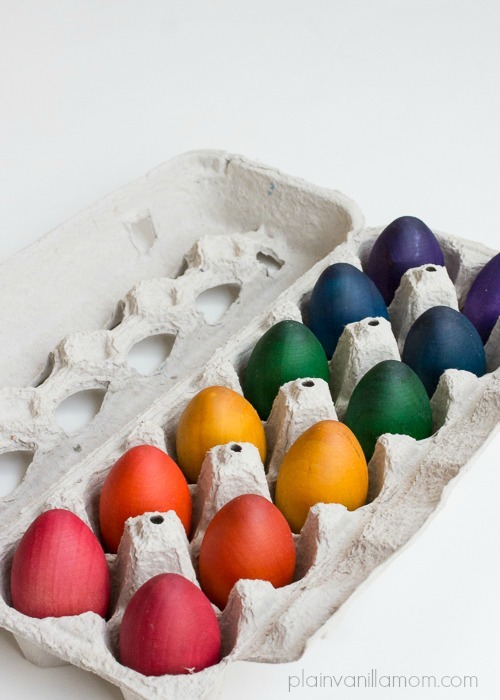 I love the wooden eggs dyed, they’re beautiful . I’m a control freak too ..lol . I don’t think I would let my little one dye them because I would want them pretty like yours!! I would have to give him his own to dye outside. Thank you for sharing your lovely eggs! Beautiful! I just love the way they turned out! I can’t stop looking at them! 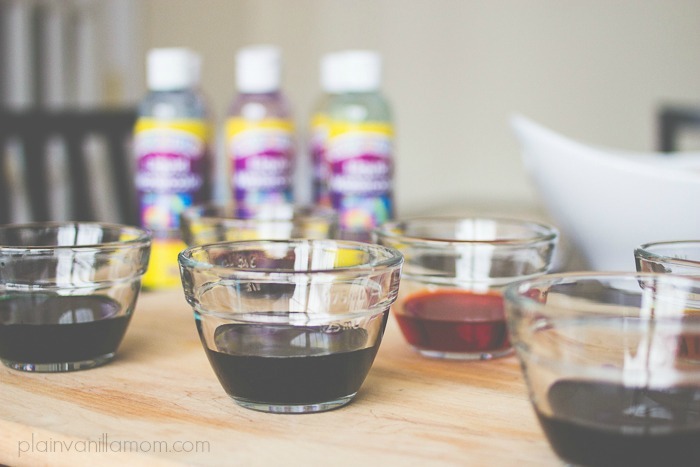 A little late to the game here, but I’m wondering what ratio of watercolor/water/vinegar you used. 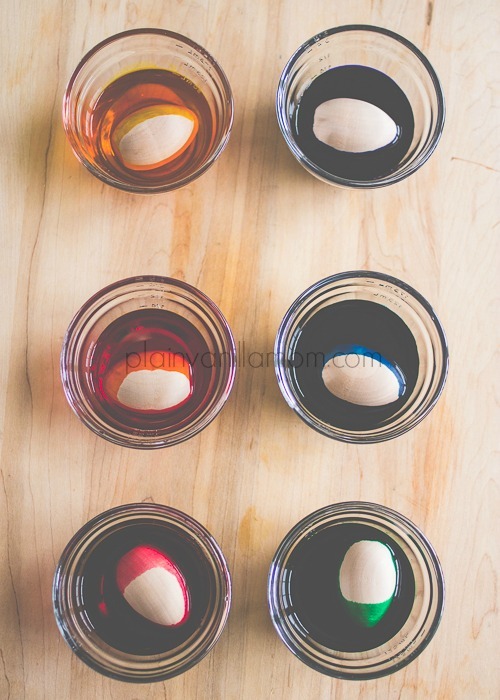 The Target dollar spot had wooden eggs and my boys are enjoying them without color, but I’d like to add color so we can use them as a learning tool. Thanks!